If you like riding horses you are on the right island! Horses are part of the local history and you can still find many horses on the Big Island – especially in and around Waimea. The scenic open landscapes here are great for horse-powered adventures, and did you know that island of Hawaii is home to the Hawaiian Cowboys? You can find our list + descriptions of horseback riding tours on the Big Island directly below. Keep scrolling to read our introduction to the history of horseback riding on Hawai’i + recommended reading further down this page. Saddle up, ride through the wide-open spaces of Waimea, the lush rainforest around Hilo, or explore the trails in and above Waipi’o valley for amazing sightseeing and back country waterfalls. Several ranches offer the opportunity to explore their (often very large) range as part of a guided horseback riding tour. Trails take you through the pastures with spectacular views of the coastline and peaks. It is also possible to see other spectacular parts of the Big Island, such as the spectacular Waipi’o valley close to Waimea or the lush rainforest around Hilo. You can also compare the prices of most of these operators, including possible discounts, on the hawaiiactivities website website. Paniolo Adventures at Ponoholo Ranch offers 5 different rides. Na’alapa Stables at Kahua Ranch. 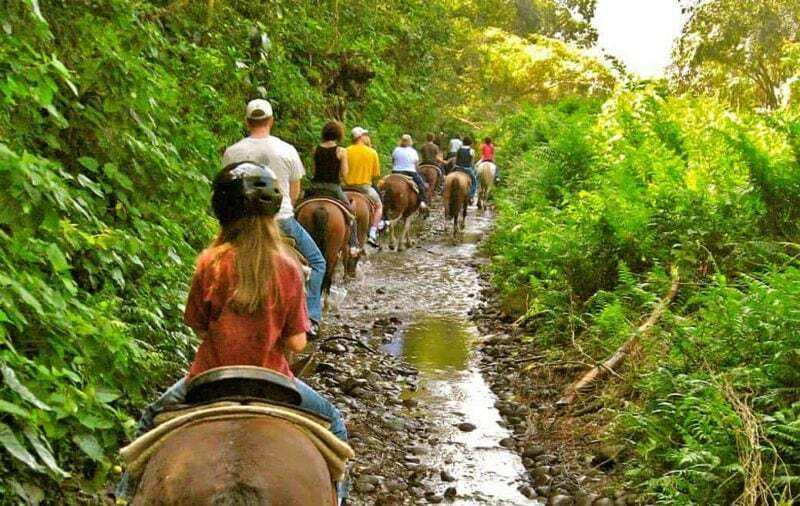 They offer a tour of the Kahua ranch and a 2.5-hour excursion on horseback deep into Waipi’o valley. Dahana Ranch (formally known as Nakoa Ranch) offers rides at their ranch that last between 1.5 and 2.5 hours. All rides need to be reserved ahead of time. Waipio Ridge Stables arranges 2.5 and 5 hour rides along the ridge of Waipi’o Valley. 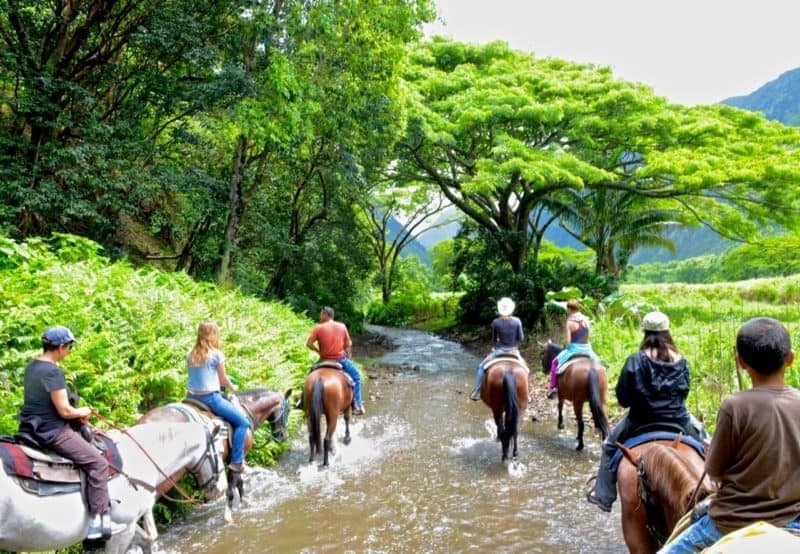 Waipio on Horseback organizes 3-hour horseback rides on the Waipi’o valley floor. Tours include transport down into the valley. Pa’ani Ranch horseback riding tour: offers small group tours of approximately one and a half hour in length riding through their 220-acre working cattle ranch for $120 per person (2018 price). The Silver Crest Farms tours take you on a 1.5 hour ride through the lush jungle of Kapoho. Hawai’i has its own brand of cowboys, or Paniolo’s, and a rich history in horseback riding. When the Spanish vaqueros (“cowboys”) arrived on the island in the early 19th century they brought the traditional euro-latin culture of riding and roping skills. The king of Hawaii hired these vaqueros to teach Hawaiians herding and ranching skills in order to control the many cows that were given to the Hawaiian royalty as a gift, but now were roaming the island almost uncontrolled. As the Hawaiian culture and Latin vaquero cultures mingled, a unique breed of cowboy emerged: the Paniolo. Waimea on the Big Island is Paniolo central, and the place to be if you like horseback riding – local style! We highly recommend this 18-page article on the Paniolo History to anyone that wants to dig deeper into the history of Hawaiian Cowboys.